NW is a small book – in page count, Smith’s shortest novel yet. There is not a scrap of fat on it. But it unfolds, like an origami water lily, and contains multitudes. 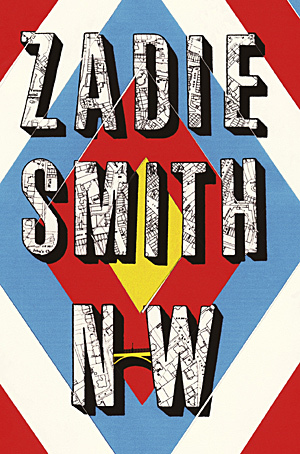 Indeed it is by making it such a small book – set in a few square miles of north-west London – and making us so intimate with her few characters, that Smith has created such a rich experience for the reader. After Hawthorn & Child, it feels like the second great London novel of the year (and yes, I did try Lanchester’s Capital). It feels, in fact, like a refinement of White Teeth and a focusing of that novel’s messy but charming potential, speaking of the encounters and fields of exchange that take place in a world city: even in part of it. The window logs Kilburn’s skyline. Ungentrified, ungentrifiable. Boom and bust never come here. Here bust is permanent. Empty State Empire, empty Odeon, graffiti-streaked sidings rising and falling like a rickety roller-coaster. Higgledy-piggledy rooftops and chimneys, some high, some low, packed tightly, shaken fags in a box. These encounters are across social and racial boundaries, and show how people who share the same streets, and labour under the same governments, engage, or fail to. There are three main sections to the book, though the characters sometimes cross into one another’s pages, to emphasise the point. Leah Hanwell anchors each end of the book. At the beginning (‘Visitation’), she has just discovered that she is pregnant, when she answers the door to a young woman, Shar, who needs to borrow money urgently. Shar is garrulous, gabby, half-charming; Leah is more distant, at a disadvantage. Shar lives in the nearby Garvey House council block, where Leah grew up (“From there to here, a journey longer than it looks”). The friction of their exchange sets up a charge that runs through the book. no offence, but for the women in our community, in the Afro-Caribbean community, no offence, but when we see one of our lot with someone like you it’s a real issue. It’s just a real issue you should be aware of. No offence. Smith breaks the story again, and takes a bigger risk, in the third section, ‘Host’, which occupies most of the second half the book. This gives us a scattered history of Leah’s friend Natalie – born Keisha – told in short, numbered sections, like Evan S. Connell’s Mrs Bridge and Mr Bridge. Natalie, even while she is still a child, while she is still Keisha, fears that she has no identity of her own (“You are making it up as you go along,” she chides herself): so she creates one. The story of Natalie and Leah is of drive and no drive: or of Drive and Neutral. The representation of Natalie’s adolescent and post-adolescent angst is just so: “she struggled to think of anyone besides perhaps James Baldwin and Jesus who had experienced the profound isolation and loneliness she now knew to be the one and only true reality of this world.” A finely judged teenage pretension also slips into the numbered sections themselves, and their titles too, which if read straight might seem to run close to affectation. It is into this part of the book that parenthood (“her whole life had essentially become work”) comes in full flood; parenthood, and the absence of it, running through the novel. It filled her with panic and rage to see her spoilt children sat upon the floor, flicking through past images, moving images, of themselves, on their father’s phone, an experience of self-awareness literally unknown in the history of human existence – outside dream and miracle – until very recently. Until just before now. It may be this part that Smith refers to in this interview, where she says that she rewrote the last third of the book after her husband, Nick Laird, told her it had gone “very wrong”. There remains a strangeness to it, an ill-fitting quality. This may be a function of the staccato telling: screengrabs of a life which don’t create an illusion of wholeness as Connell’s Bridge books do. It may be of the sadness which begins to overwhelm the book in the second half, and sits oddly with Smith’s always sparky prose. Yet the more I thought about this section, the more I felt that these were ‘problems’ that, more than anything, demand another reading to get to grips with. (Increasingly, I am of the view that I should read a book twice before committing any thoughts to writing at all.) New things are, by definition, strange, and NW feels new all the way through. It’s almost in the title. The book is full of how we live now, but it has a traditional feel for people, and for language across generations and social classes: like a third way between Smith’s two directions for the novel. It also feels like a breakthrough for Smith, in a sense her first mature work. Her previous novels were written before the age of 30, and ultimately fell down to a greater or lesser extent: books I enjoyed, but wouldn’t reread. Not so NW, a novel altogether tighter and trickier to unlock. My feelings about it are similar to those for Damon Galgut’s In a Strange Room: quibbles while reading, once I began thinking and writing about it, began first to dissolve and then to transform into praiseworthy qualities. Not incidentally, I was softened up a little by finding an author at the top of her game who shares so many of my cultural references: a late-thirties thing, I suppose. How many novels, after all, contain a chapter titled Spectrum 128k? I’m going to give this a go on your recommendation, John. I wouldn’t otherwise as I didn’t enjoy White Teeth and thought On Beauty was fluff at best. But after Hawthorn & Child you can do no wrong … for now! Well I’m just glad you didn’t read The Autograph Man, James. That really was poor. I really think this one is terrific, though, and I’ve been surprised by the mixed reception it’s had in some quarters. I’ve never been interested in her stuff before John, and you had me convinced with this review. Then I read the dastardly Mars-Jones’s piece and now I’m all undecided again. Mixed reception is right. Yes, it’s an odd piece, the Mars-Jones one, all forensic on the details but, in my view, missing the bigger picture. I have a huge amount of respect for him, but it seems to me that the particulate nature of the book is largely its point. Anyway, I’m sure you can read a sample somewhere (the opening was in the Guardian, and I’m sure Amazon has some). If you like the first few chapters, you’ll probably like the whole thing. Great review. I suspect you’re right about it demanding a second reading. I struggled to find words to explain what I did and didn’t enjoy here. Certainly the experimental nature of the prose was a distancer that perhaps won’t seem so strange on re-reading. I don’t know whether to read this. On Beauty wasn’t my favourite, to say the least, and I don’t know if I can bring myself to read something with so much hype around it, to be let down. I thoroughly enjoyed reading your review. A superb and persuasive review, John. I must say I do wish The Guardian had run with both this and the Mars Jones piece (which is a typically brilliant piece of writing but seems to have assassin drool slathered all over its carefully calibrated savagery) together as Empire once did (* and ***** reviews sat beside one another) with Henry: Portrait of a Serial Killer, to great effect (and use). In any case, I side with you on this occasion. It’s easily her best book for me, and light years beyond The Autograph Man. I know what you mean about the shared cultural references. I feel the same about Julian Barnes as we are of a similar age and background. Your review is excellent and like Lee, I find it persuasive. I’ve always thought Zadie Smith a talented writer but I thought both White Teeth and On Beauty were far too long and lost focus. I thought her editor had indulged her too much. If, as you say, this is her best work so far, and is sharper and leaner then it sounds an attractive read. Thanks for writing the review. I know what you mean regards putting something off because of the expectations. I suffer from the same action paralysis. I’ll probably still take time out for this though, simply because i havent read any of her previous work (honestly). Just out of interest, in the category of fiction, have you heard of Gary Murning? He’s gone a little unnoticed so far. He’s got a nice collection of fiction works that not many seem to have come across, but definitely worth checking out. I really enjoyed your review, and, like you say, this is certainly a novel that could do with rereading. I think Zadie Smith is brave for delivering an experimental novel to a largely mainstream audience, for she will certainly lose a chunk of her readership. My initial impressions of the novel were not good. It is an interesting work, but mostly flawed, and it’s a question of structure and focus. I understand that she’s trying to replicate the disparate and asymmetrical nature of the city, and the passages describing the capital are charged with energy and scintillating prose; but, to make this investment worthwhile, the characters must also be interesting, and unfortunately they are not. Felix is the tightest and most fully-realised character of all, and that, tellingly, is in the novel’s most conventional section. Did the friendship between Leah and Natalie feel authentic? Not really. And as the Leah/Natalie relationship is the novel’s central concern, it seems a large failing. That being said, it is definitely a transitional novel, and I look forward to reading her next, however long the wait. But it leaves a fog of ambivalence, and that may only lift with a second read. This was a really enjoyable post. I was also interested by Smith’s essay on Netherland and Remainder, particularly her feeling that O’Neill’s novel was such a literary catharsis for 9/11 trauma. I’ve yet to read any of her non-critical work so may give NW a read based on this! If she holds her meticulously high literary standards when she is producing the novel then I’m sure I won’t regret it.